Clue as you know it will never be the same. The much-beloved murder mystery game is getting a makeover. It’s been on the shelves for 60 years, but game maker Hasbro has redesigned the game for a modern audience. The new game, Clue: Discover the Secrets, takes place during a soiree at a millionaire mogul’s mansion turned deadly, and you must find out who is responsible for murdering the host. The weapons have changed, and the now have characters have detailed bios and back stories. And the mansion has new rooms, including a spa, a theater and a guesthouse. There are now nine weapons instead of six — there is no more lead pipe, the revolver is now a pistol, and a trophy, an ax and a baseball bat have been added as potential weapons. The characters have changed, as well. Miss Scarlet now has a first name: Cassandra. Colonel Mustard has left the military; he’s a former football star. And Victor Plum, formerly the professor who was always known as the smartest man in the room, became a dot-com billionaire. But while many of the details have changed, the gameplay is reassuringly familiar: You’ll navigate through the lavish rooms of the mansion and discover clues that will help you uncover the secrets to solve the “who”, “where” and “with what” of the mystery. 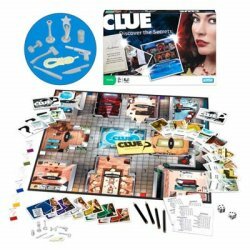 Each player is the holder of several clues that may help determine the winning solution, and by rolling the die and moving through the mansion, players start rumors and discover clues, which will help them guess the solution to the puzzle. Additionally, new game-changing elements such as Clock cards and Intrigue cards quickens the pace of the game and keeps players on the edge of their seats. The winner is the first player who figures out who killed the host, the weapon used and in which room. But, make sure you’ve thought through the accusation — guess wrong and you lose the game! Learn more about Clue: Discover the Secrets! My sister got this game for christmas and I must say this game is wonderful. I would give the game a 9 & half out of 10! The game looks interesting but seriously i don’t get how to play!!! Someone help! mine didn’t come with pencils!!!!!!!!!!!!!! !